It might seem like celebrity wedding fever has just picked up in the last few years, but we’ve been obsessed for years with Hollywood stars and royal figures tying the knot. There’s just something about the glitz, glamor, and inevitable drama that catches the public’s attention. 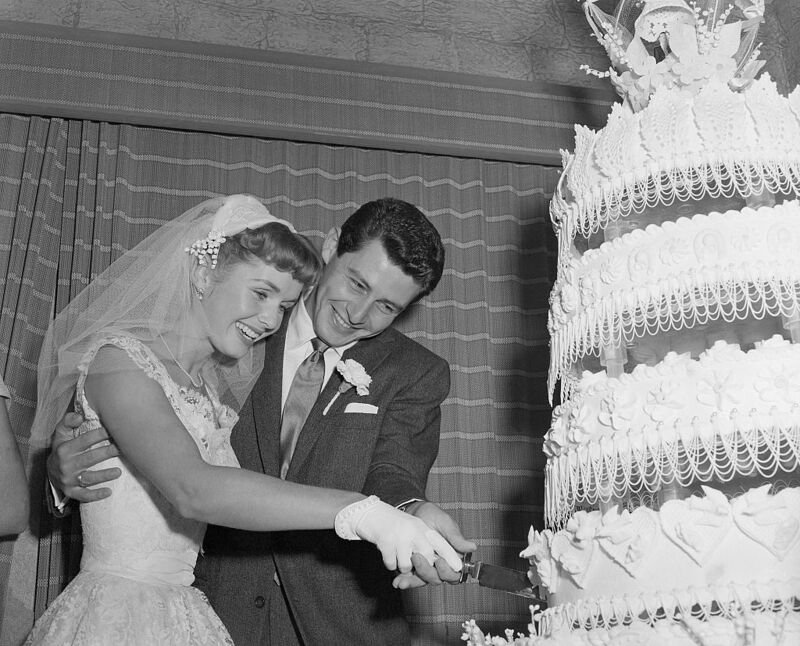 Weddings are meant to be timeless and many celebrity weddings from the ’40s, ’50s, and ’60s are absolutely unforgettable. From Brigitte Bardot designing her own dress to Elizabeth Taylor’s eight different weddings, these Old Hollywood stars truly set the standard for celebrity weddings. 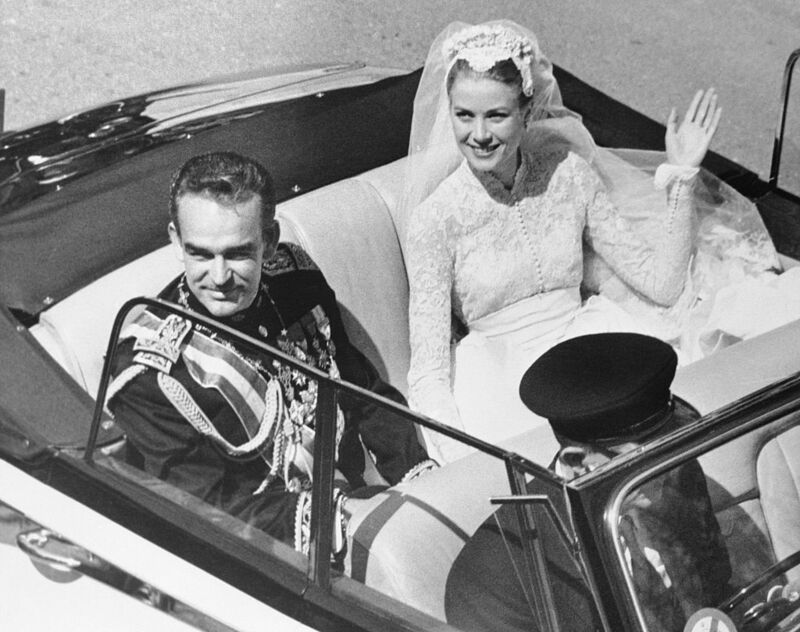 We’ve seen the photos of Prince Harry and Meghan Markle, but do you remember the original Cinderella romance between Grace Kelly and Prince Rainier? Elizabeth Taylor And Conrad “Nickie” Hilton Jr.
Elizabeth Taylor is the queen of Hollywood marriages. Over the course of her lifetime, she married eight different times. Her first marriage was in 1950 to Conrad Hilton Jr., who was the heir to the Hilton Hotel chain, and yes, was Paris Hilton’s great-great-grandfather. Taylor was only 18 at the time of the marriage. The nuptials didn’t last long and within a few weeks, Taylor realized she’d made a mistake. It also didn’t help that Hilton was an abusive, heavy drinker. The two were granted a divorce eight months later in 1951. Mary Pickford was considered one of Hollywood’s pioneering actresses. 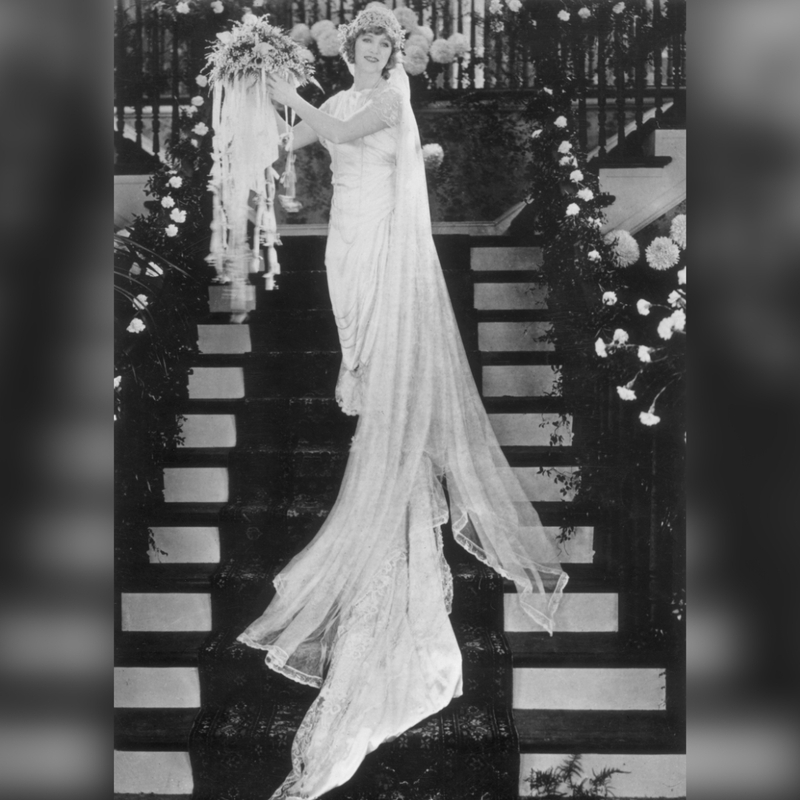 She was born into a theatre family and was one of the few who survived the transition from silent films to “talkies.” At the peak of her stardom in 1920, she married fellow actor Douglas Fairbanks. The two had actually been in a secret relationship for a few years while Pickford was married to someone else. It was very scandalous at the time but it worked in their favor, and the two went on to co-found a production company. Our next star didn’t actually get married but her “wedding day” dress was still photographed as she wore it and showed it off. 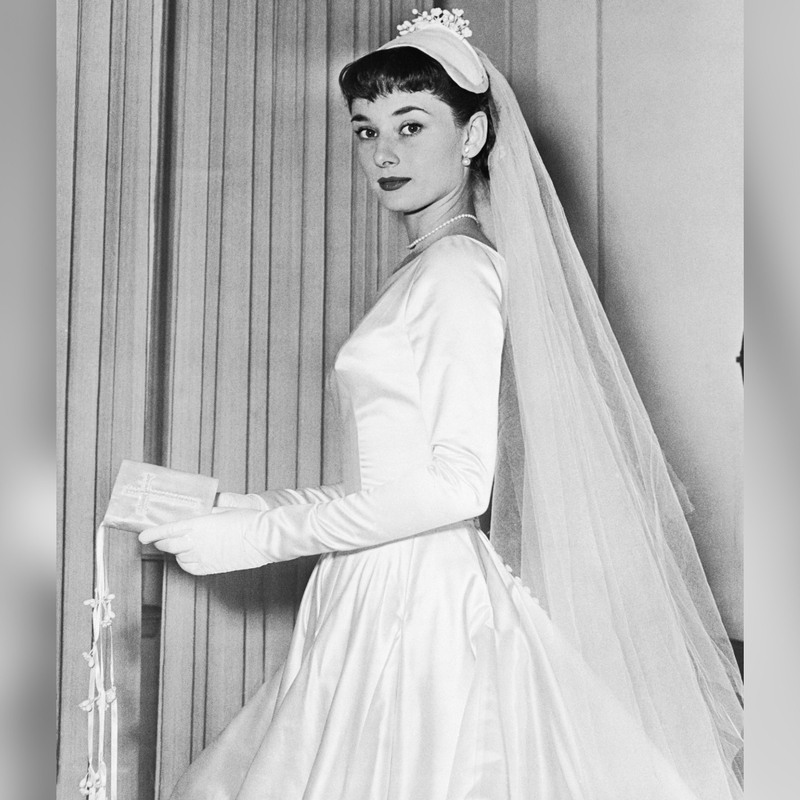 In 1952, actress Audrey Hepburn became engaged to businessman James Hanson. By all accounts, Hepburn seemed head over heels in love and even called it “love at first sight.” The two set a wedding date and Hepburn even had her dress fitted. At the last minute, she decided the marriage wouldn’t work because of their conflicting schedules. The pair called off the engagement but this photo of Hepburn in her original wedding dress still exists. Keep reading to see the woman behind the most controversial royal wedding. 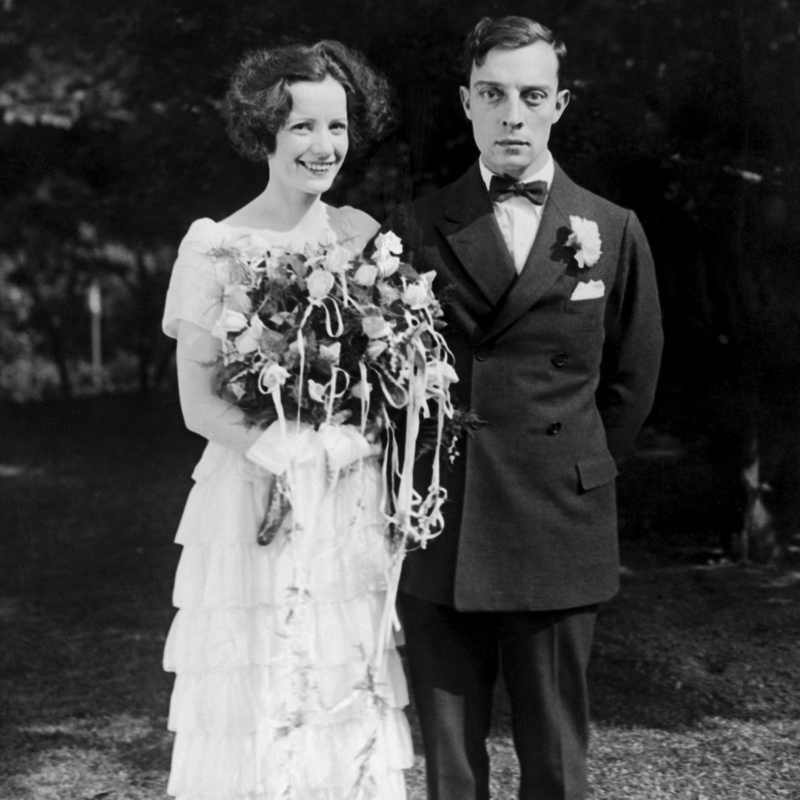 Even at his wedding in 1921, legendary silent film star Buster Keaton played up to his nickname of “The Great Stone Face.” Keaton married Natalie Talmadge, who was his co-star in the film Our Hospitality. The two appeared to be a happy couple but the marriage began deteriorating after the birth of their first child. Keaton dated other actresses during their marriage and the two eventually divorced in 1932. Keaton was so devastated that he briefly became an alcoholic. 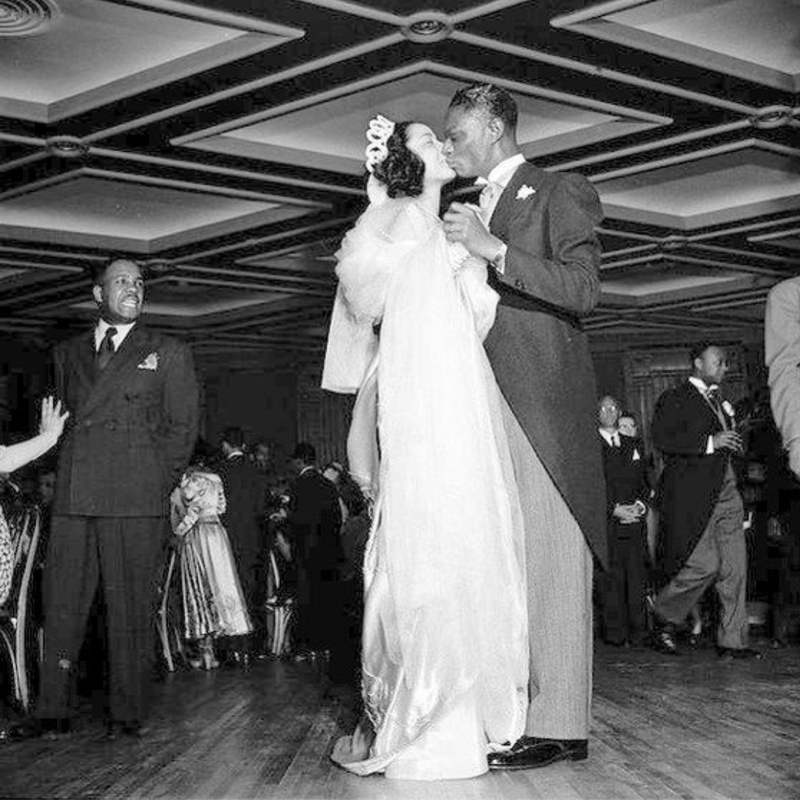 After years of an on-again-off-again courtship, ol’ blue eyes finally tied the knot with actress Ava Gardner. It was his third marriage and one of his highest profile ones. The two spent most of their six-year marriage in the tabloids for their antics. One notable escapade included the time Sinatra’s publicist had to bail the couple out of jail after they went on a “drunken joyride” at 3 AM and shot out several shop windows with their pistols. 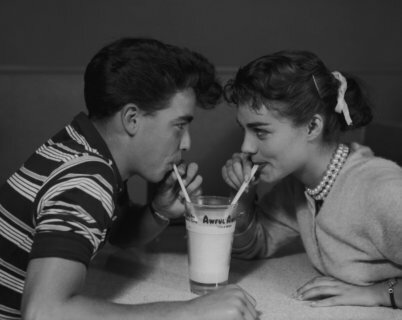 The pair divorced in 1957 but remained friends for the rest of their respective lives. The marriage that took down the British empire was one of the most talked about relationships of the 1900s. 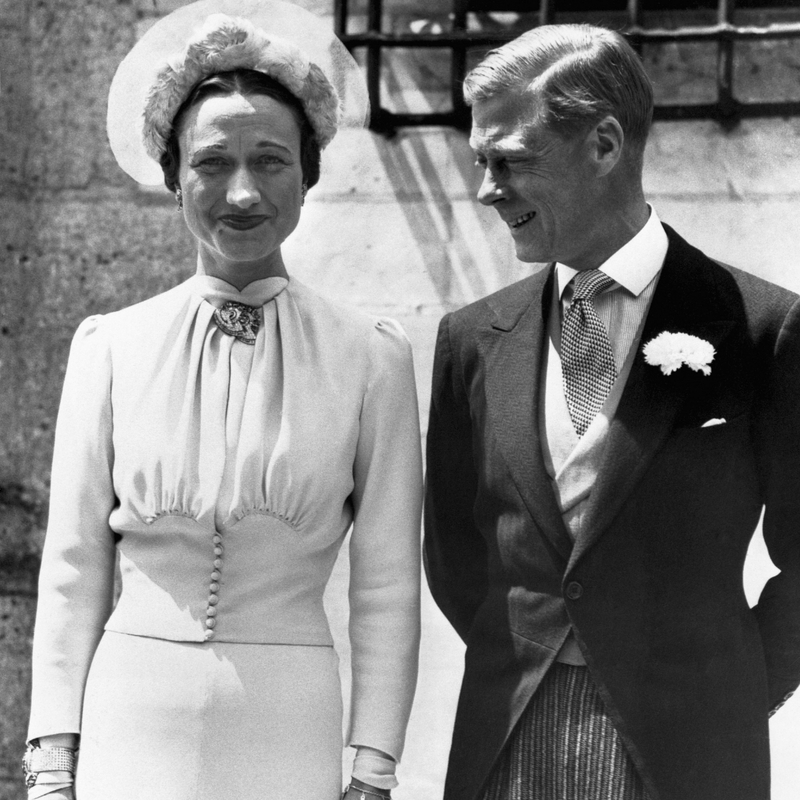 Born in Baltimore, Wallis Simpson was an American socialite and divorcee when she met Edward in 1931, who was then the Prince of Wales. Edward later became King Edward VIII of Great Britain but abdicated the throne after eight months to marry Wallis. Their marriage was as controversial and as extravagant as it could get. Wallis wore a blue dress at their marriage in a French castle. 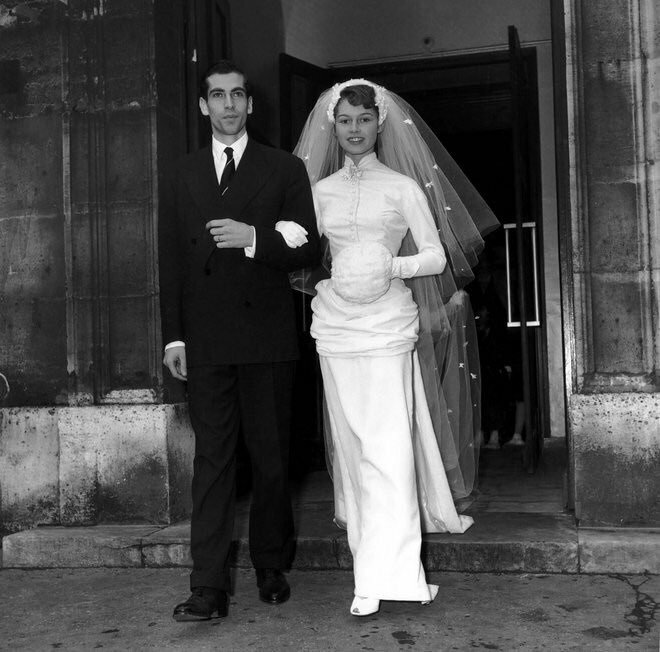 Coming up, you won’t even recognize Brigitte Bardot on her wedding day. 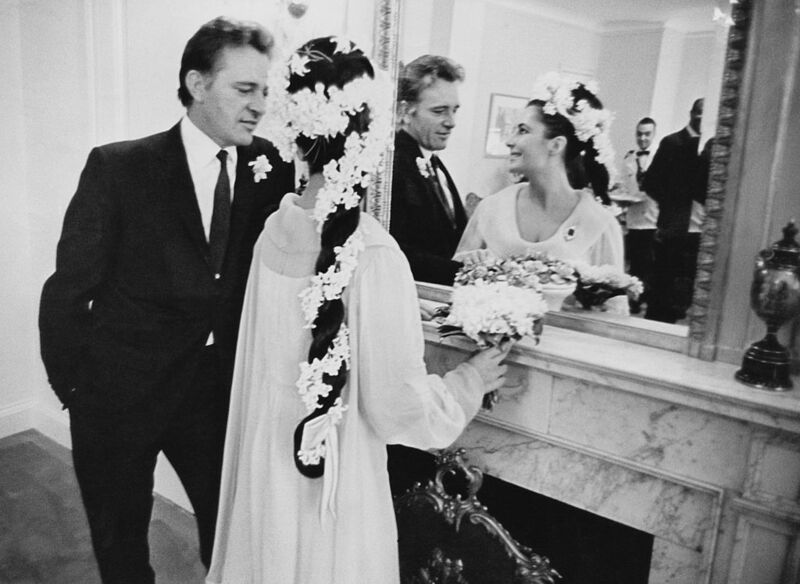 After four unsuccessful marriages, Elizabeth Taylor tried to give it another go in 1964 when she married her Cleopatra co-star Richard Burton. The two began seeing each other while Taylor was still married and their affair was even condemned by The Vatican. 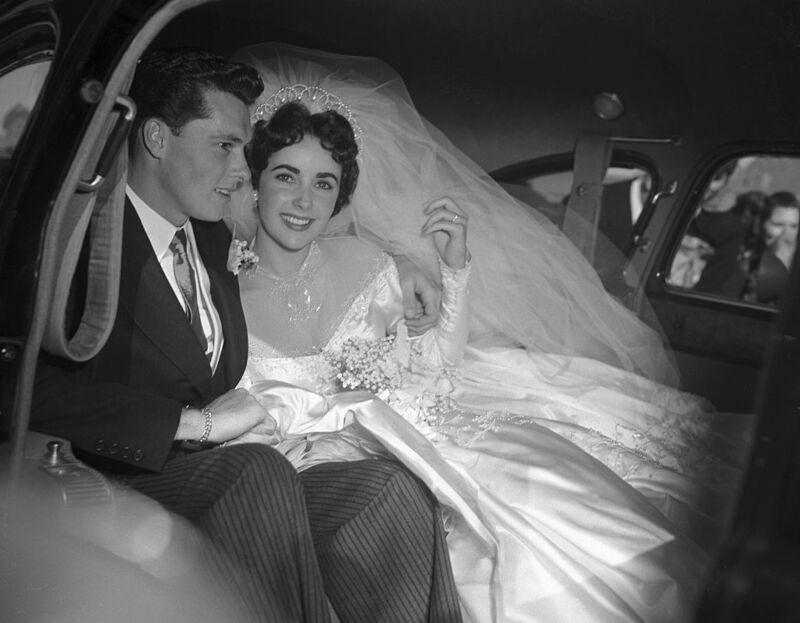 Nine days after her divorce from Eddie Fisher, Taylor and Burton were married. 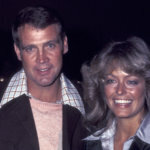 The pair divorced ten years later in 1974 but remarried in 1975. They once again divorced in 1976 for good, but Taylor always referred to Burton as the love of her life. It’s hard to recognize a young Brigitte Bardot without her signature long, blonde hair. This photo of Bardot on her wedding day to Roger Vardim was taken in 1952 when she was only 18. At the time, she was still a struggling actress in France. The marriage lasted until 1957, after which she withdrew into seclusion. If you love her unique wedding dress, you’d be impressed to find out that the young starlet designed it herself! The next Hollywood star is like the original Meghan Markle. Long before there was Meghan Markle and Prince Harry, there was Grace Kelly and Prince Rainier. Kelly began acting when she was 20 years old but retired after only six years in order to marry Rainier and assume the title of Princess of Monaco. The pair had both a religious and civil wedding in 1956. The religious ceremony was one of the first to be televised and was estimated to have been watched by more than 30 million viewers. These two Hollywood stars actually got married twice. 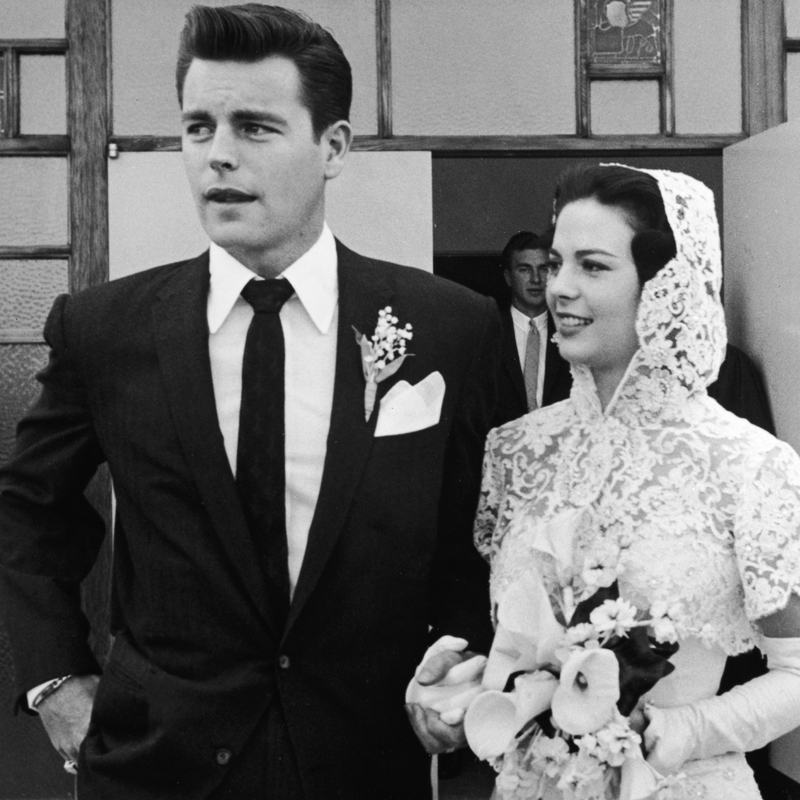 This photo from their first marriage in 1957 shows a 19-year-old Natalie Wood and a 26-year-old Robert Wagner. Their marriage lasted until 1962 and they separate for ten years. The pair reconciled in 1972 and married again. 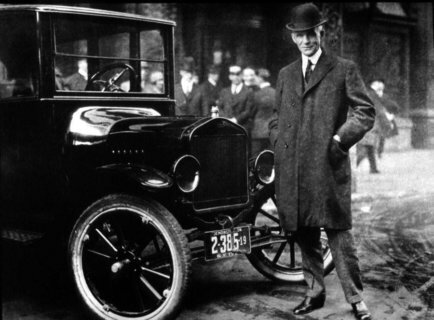 They seemed happily married and had a child together until 1981 when Wood died. The pair were sailing on Wagner’s yacht with their friend Christopher Walken when Wood drowned. The circumstances surrounding her death are still unknown and many have wondered if Wagner had any part in it. Keep reading to see what John Lennon looked like on his wedding day. Taylor’s third marriage came in 1957 to film producer Mike Todd. The pair seemed to be a perfect match, as Todd could match Taylor’s love of theatrics. He’d often call the press and bring attention to their relationship. One year he even had Taylor’s birthday party televised. It seemed that their marriage would be Taylor’s final one until Todd died tragically in a plane crash in 1958. His death left her devastated and alone raising her three children. The relationship that may or may not have broken up The Beatles began in 1966, when John Lennon attended one of Yoko Ono’s art exhibitions. 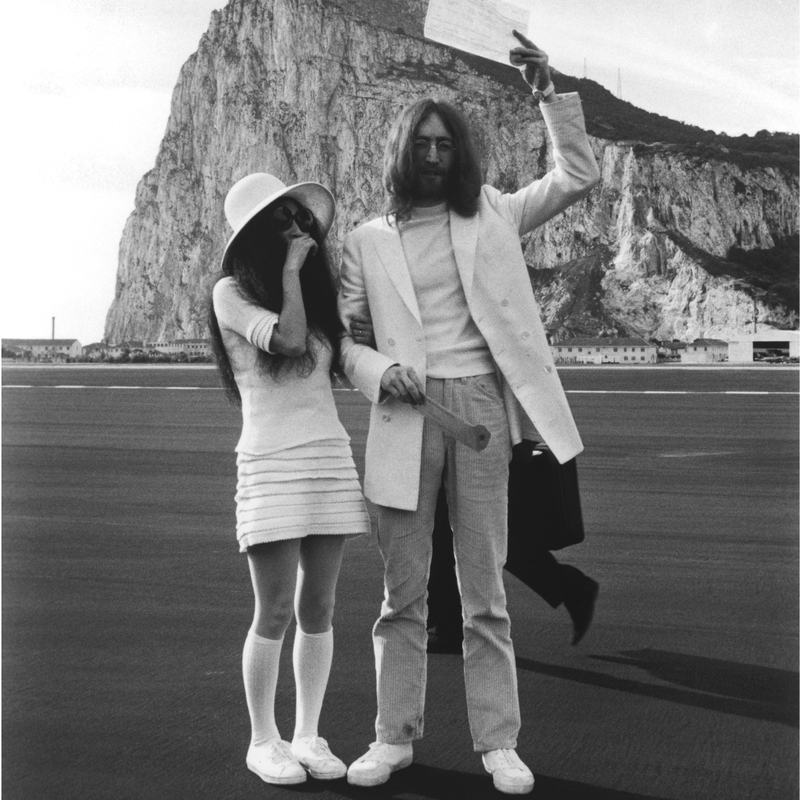 Lennon was still married to his first wife Cynthia and Ono to her second husband Anthony Cox. Once they had both been granted divorces, the pair married in 1969. They famously used their honeymoon at the Hilton Amsterdam as a platform for one of their bed-in protests against the Vietnam War. Keep reading to see another Beatles wedding. Sammy Davis Jr. struggled throughout his career with marriage controversy. His first love was to actress Kim Novak, but he wasn’t able to marry her because she was white. As a result, his publicist arranged a marriage to black dancer Loray White as a way to quiet the controversy, but the marriage didn’t last. 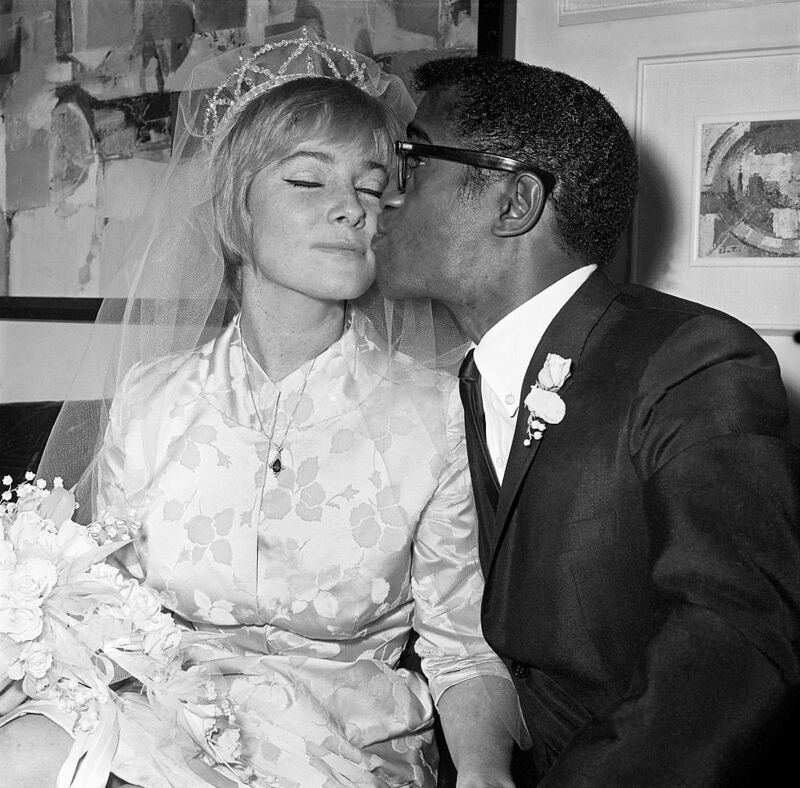 In 1960, Davis Jr. caused controversy by marrying May Britt, a white Swedish-born actress. They were together for eight years and had one child and two adopted sons. 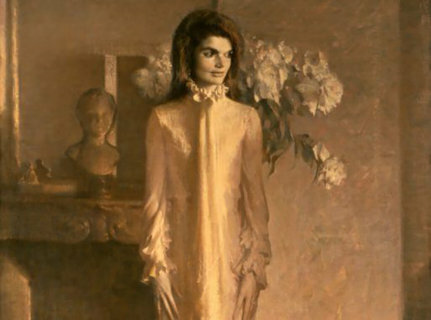 They may not have been a part of Hollywood, but John and Jackie Kennedy were practically American royalty. 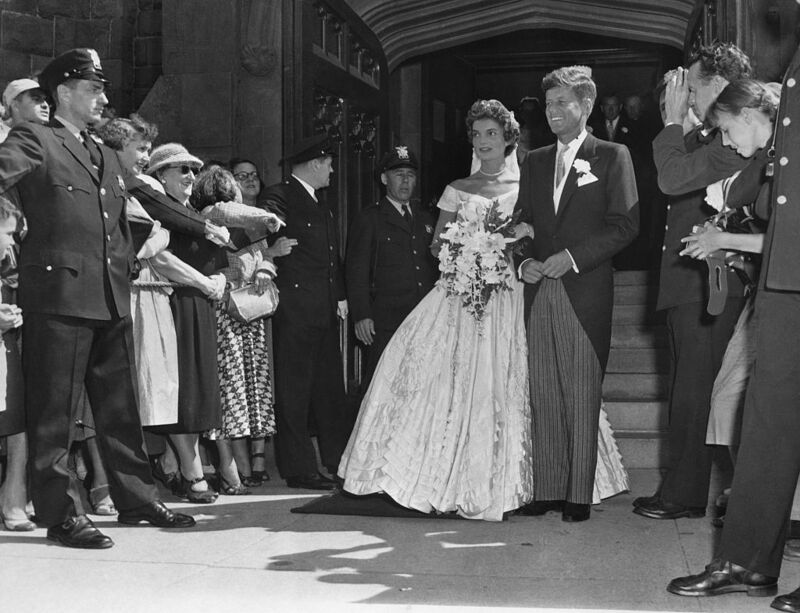 The two met while John was running for the U.S. Senate in 1952 and one year later, they were engaged. Her wedding dress needed more than 50 yards of fabric to make! 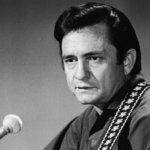 While they seemed like the perfect couple from the outside, John had many not-so-secret affairs that left Jackie bitter and depressed as she raised their two children. Debbie Reynolds married singer Eddie Fisher in 1955 and they had two children, including the late actress Carrie Fisher. 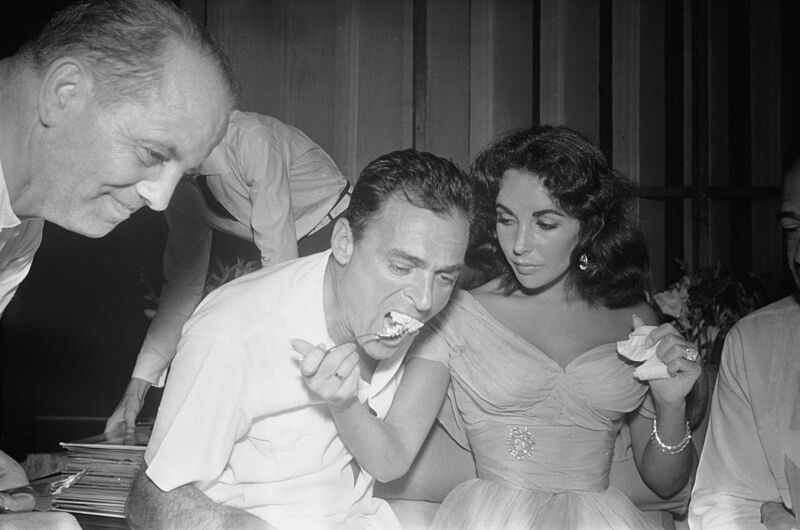 Their marriage was picture perfect until 1959, when Fisher began having an affair with Elizabeth Taylor. Fisher was a close friend of Taylor’s late husband Mike Todd, and consoled her after his tragic death. 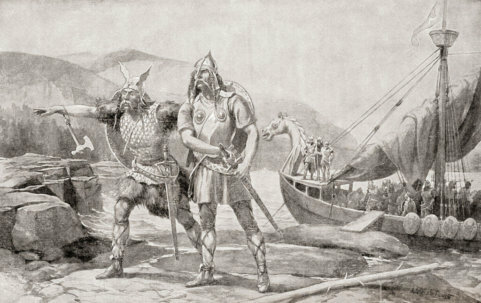 The Fisher-Taylor affair was a huge scandal and even led to the cancellation of his television show and began a decade-long feud between Reynolds and Taylor. Another happy Beatles marriage happened in 1969. 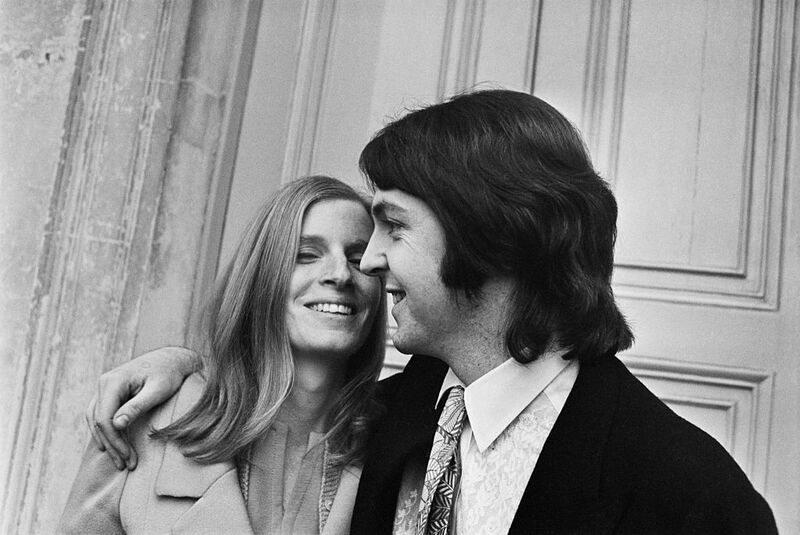 Linda Eastman was a music photographer and met Paul McCartney in 1967. The two had an instant connection and married in a small, civil ceremony two years later. Here, they are seen outside the register office in London. The next two stars are mother and daughter, and they both had glamourous weddings. Judy Garland had a difficult time transitioning from being a child star to a respected adult actress. 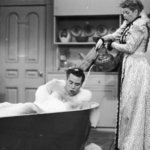 After marrying director and producer Vincente Minelli in 1945, she gained more adult credentials. The two remained married for six years but many speculated their nuptials were an attempt at bearding. 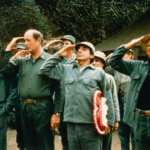 Many speculated that Minelli was either gay or bisexual, while Garland has long been renowned as a gay icon in Hollywood. Whether the rumors were true or not, the couple did welcome one child in 1946. 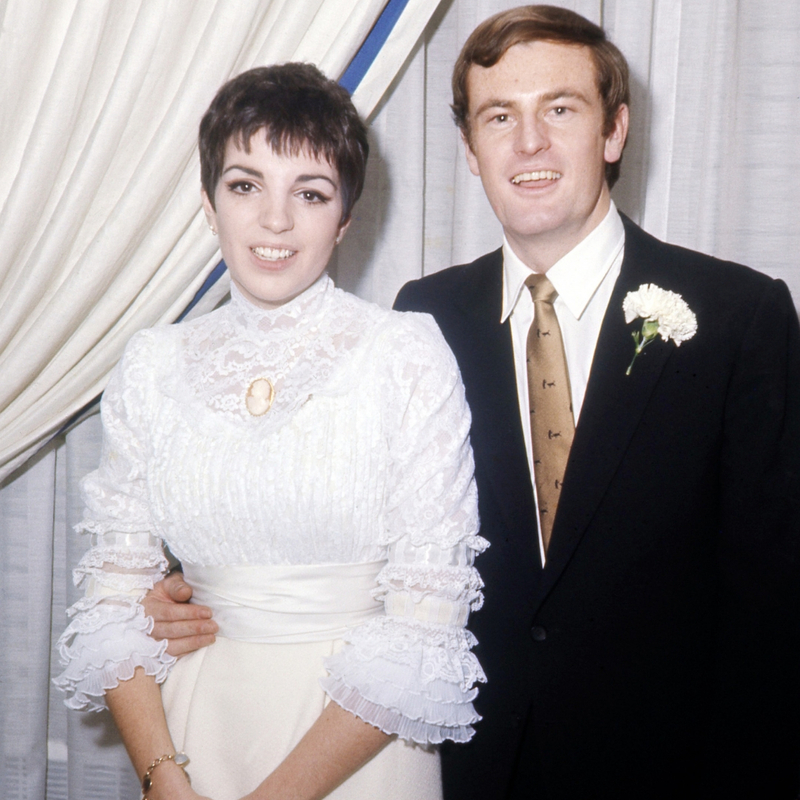 Two decades after her mother married Vincente Minelli, Liza Minelli married entertainer Peter Allen. 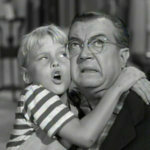 Allen was actually considered the protégé of Minelli’s mother, which was how the two met. The couple wed in 1967 and divorced in 1974 after Minelli found out that Allen was gay. 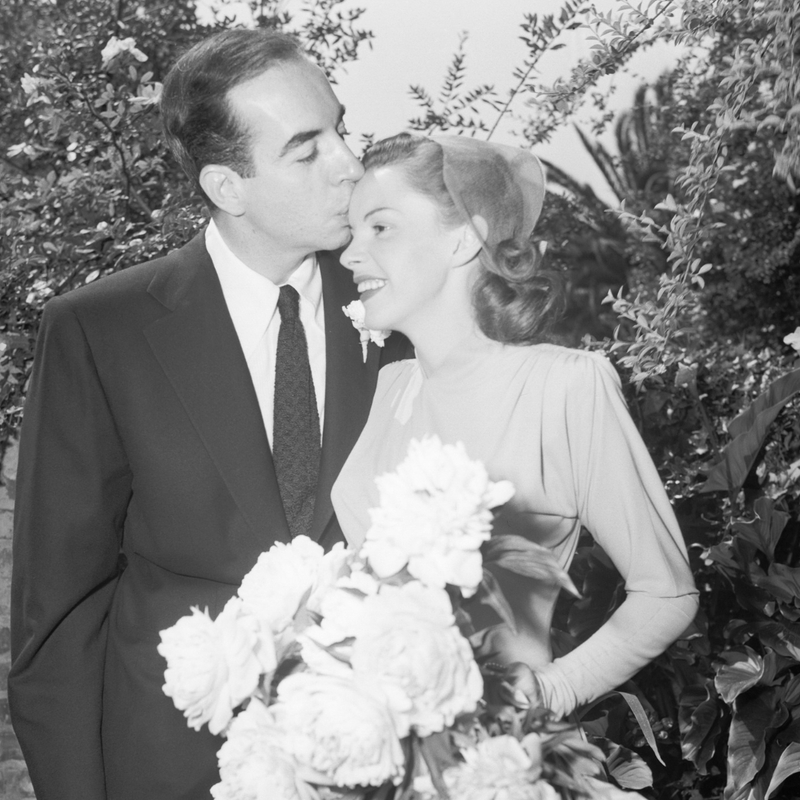 When looking back on the marriage, Minnelli admitted that she felt “everyone knew but me.” She married two other times in her life but never had any children. Maria Ellington was touring as the opening act for the Nat King Cole Trio when the two fell in love. At the time, Cole was married to his teenage sweetheart Nadine Robinson. Cole ended up filing for divorce and just six days after the proceedings were finalized, Cole and Ellington were married. The risk was well worth it and the couple stayed together until Cole’s death in 1965. They had five children, one of whom went on to have their own successful music career. 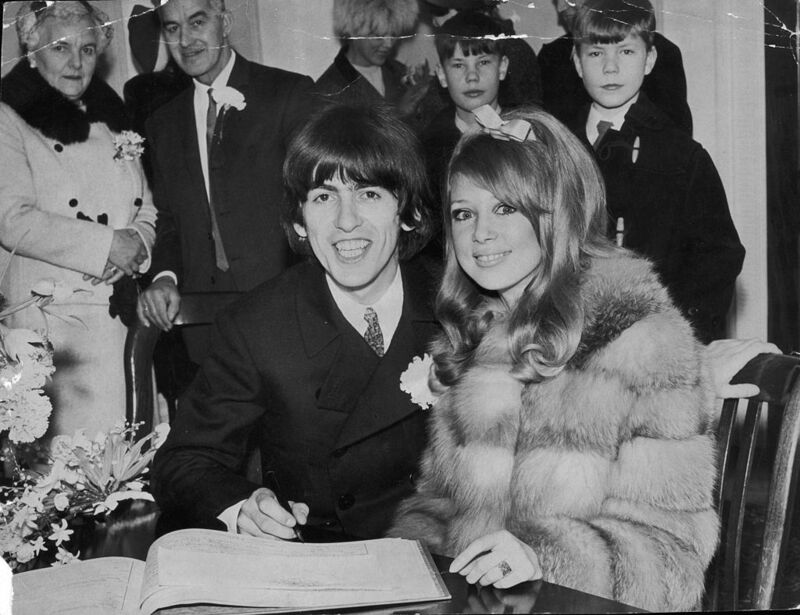 The final Beatles-related wedding to make this list (sorry, Ringo) came between George Harrison and Pattie Boyd in 1966. The marriage between the model and the singer was a big tabloid story. She served as a huge influence on many Beatles songs such as “For You Blue,” “I Need You,” and “It’s All Too Much.” Unfortunately for Harrison, Boyd left him in 1977 for his friend, Eric Clapton. 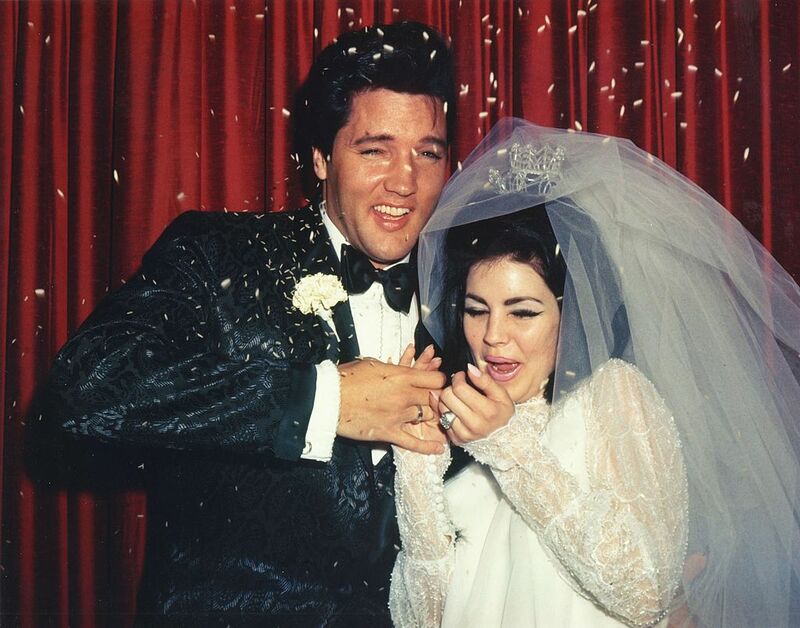 Elvis and Priscilla’s marriage was always controversial. The two met when Priscilla was only 14 years old. Her family was living near an Army base in Germany where Elvis was stationed. Elvis was reportedly infatuated with her and started a seven-year courtship. Finally, the two married in 1967 and Priscilla actually made her own dress for the occasion! The two had a relatively unhappy marriage though and Priscilla left him in 1972 for her karate instructor. For such a mega-star like Jane Fonda, her wedding reception was as low-key as it gets. Her marriage to French film director Roger Vadim was her first of three. Of course, his first marriage happens 12 years beforehand to French actress Brigitte Bardot. The pair tied the knot in 1965 at the Dunes Hotel while Fonda wore a simple, white dress that was remnant of the 1960s. The pair had one child—a daughter named Vanessa—before they divorced in 1973. 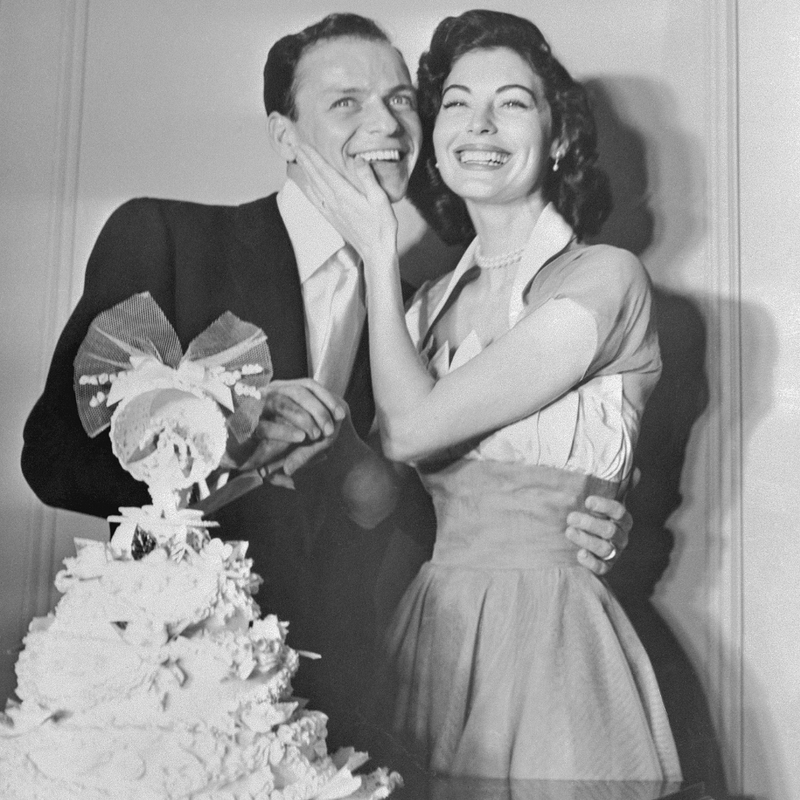 After his 1957 divorce from Ava Gardner, Frank Sinatra waited until 1966 to marry again. His marriage to Mia Farrow was short and only lasted about 18 months. The two remained friends for life and even continued to have a sexual relationship. 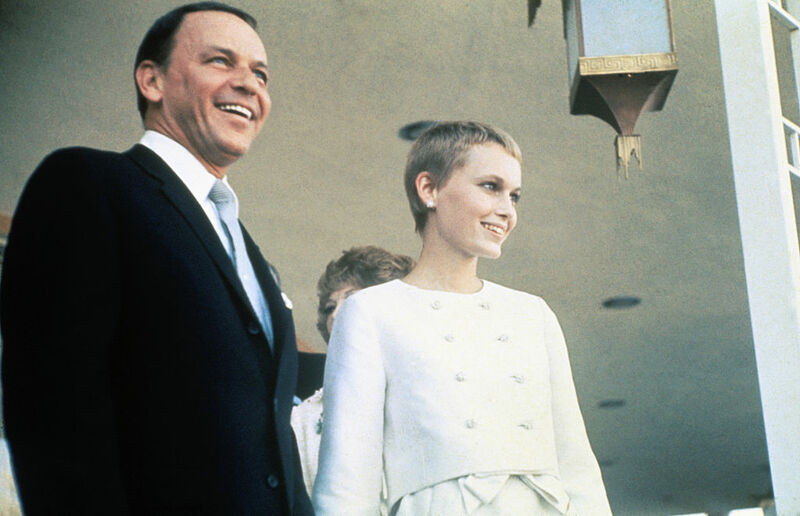 Farrow once said that Sinatra could be the father of her son Ronan, who wasn’t born until 1987. While Nancy Sinatra later dismissed the fathering claims as “nonsense” it’s no secret that Sinatra was a lifelong ladies man. Blonde bombshell Marilyn Monroe first married when she was 16, but when she wanted to become an actress, her first husband disapproved so she filed for divorce. She wouldn’t marry again until 1954 when she met Joe DiMaggio. 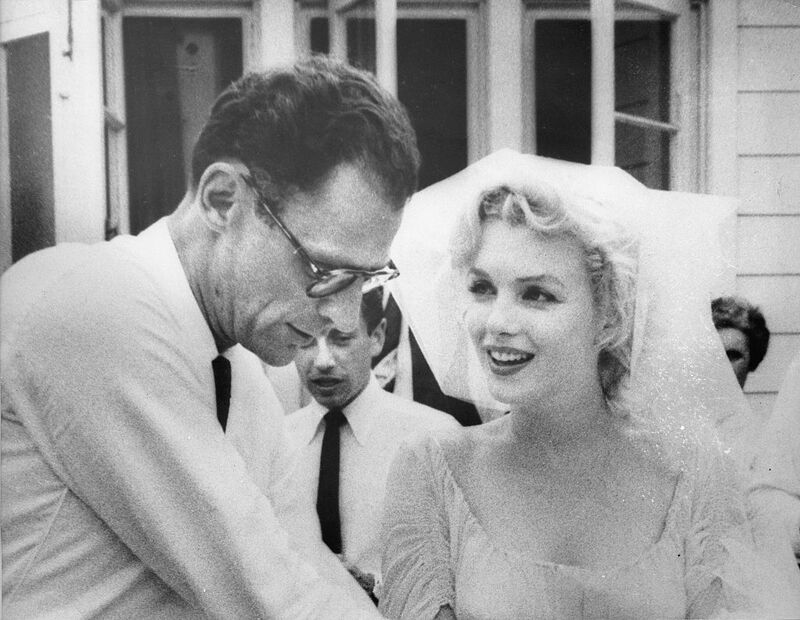 The high profile marriage crumbled after only a year, but Monroe eventually met her true soulmate, Arthur Miller. 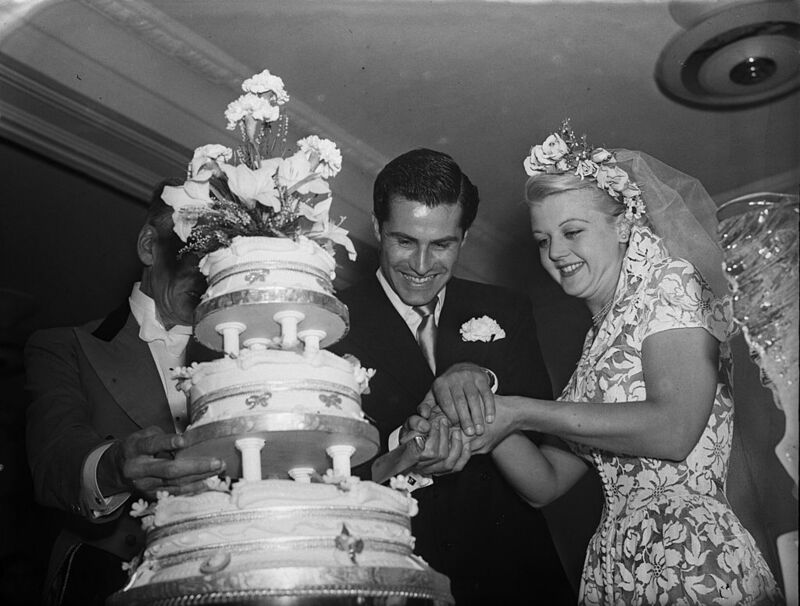 Monroe and Miller married in a quiet ceremony in 1956 and remained together until 1961. One year later, Monroe was tragically found dead. 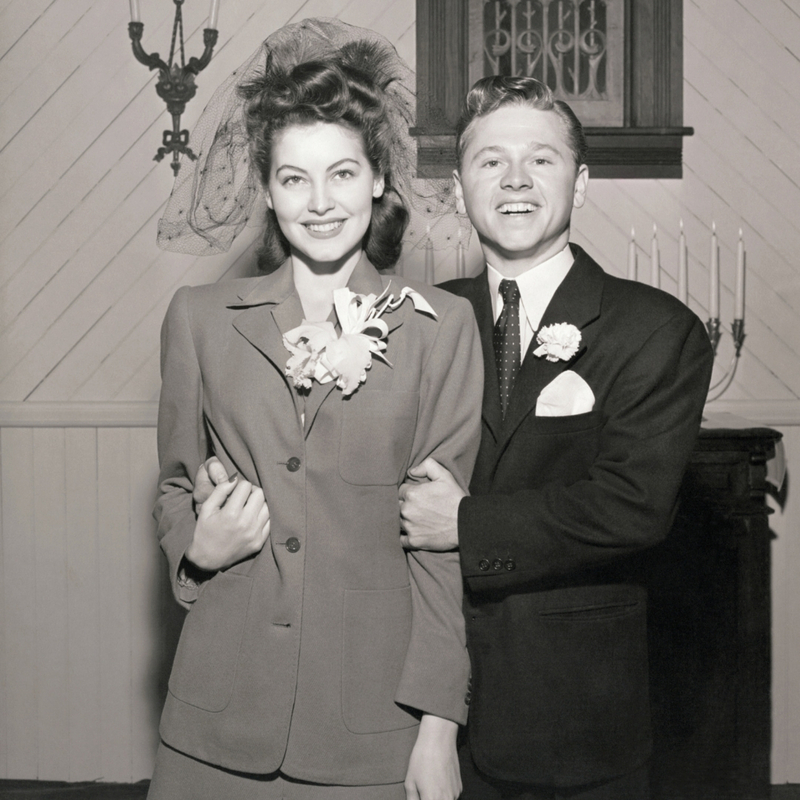 Before her tumultuous marriage to Frank Sinatra, Ava Gardner was married to actor and comedian Mickey Rooney. Rooney was a full-fledged star when he married Ava in 1942, while she was still a relatively unknown teenage starlet. The two divorced less that one year later reportedly because he was unfaithful. It worked out in Gardner’s favor though because the marriage helped her rise to prominence in Hollywood. Two years after the divorce, she landed her big break in The Killers. Actress Lauren Bacall’s first marriage was to legendary film director Humphrey Bogart in 1945. 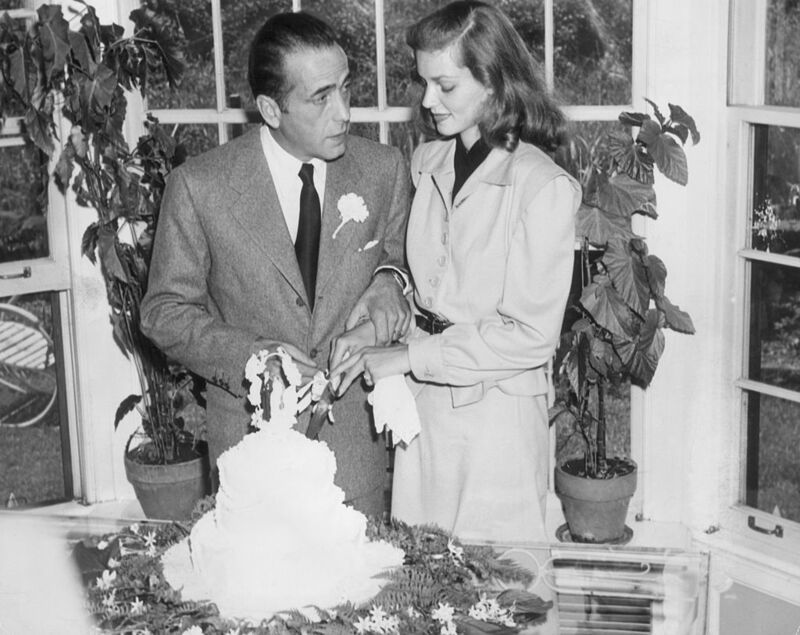 At the time of the ceremony, Bacall was 21 and Bogart was 47. The age gap didn’t seem to be a big deal for the couple though, and they stayed together until Bogart’s death in 1957. 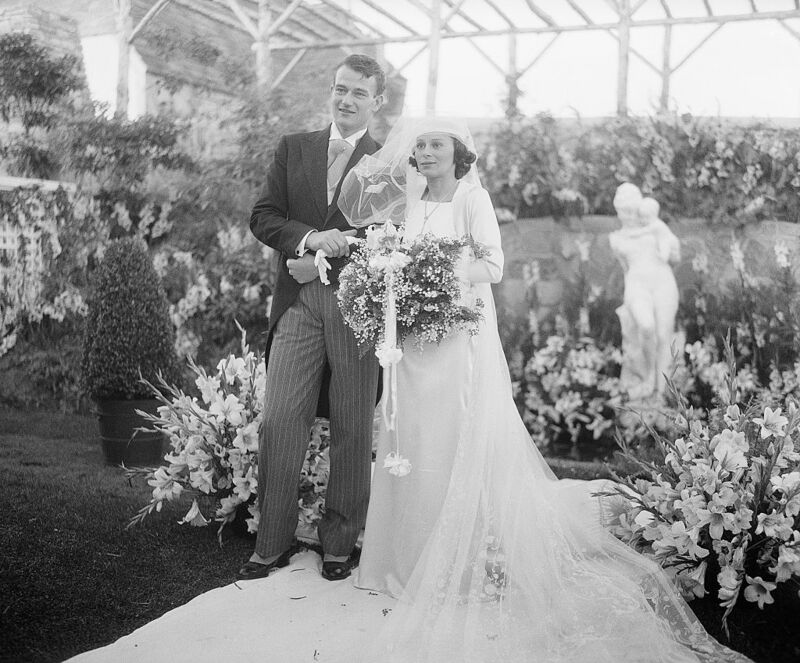 John Wayne was hardly an A-list celebrity when he married his first wife, Josephine Saenz, in 1933. 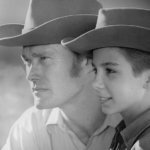 The couple had four children but divorced in 1945, coincidentally when Wayne began landing bigger acting roles and gaining fame. Wayne actually left Saenz for a Spanish actress Esperanza Baur. 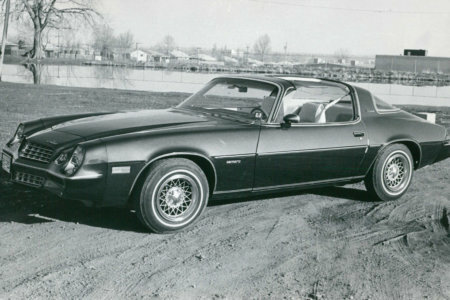 Wayne and Baur’s relationship was much more high profile and ended in dramatic fashion when Baur tried to shoot Wayne in cold blood for allegedly having an affair. Actress Angela Lansbury is one of the few Hollywood stars who had very stable relationships. Her first marriage to Richard Cromwell ended in divorce after only one year, but the two remained friends for life. Her second marriage to Peter Shaw, shown here, lasted 54 years until his death in 2003. 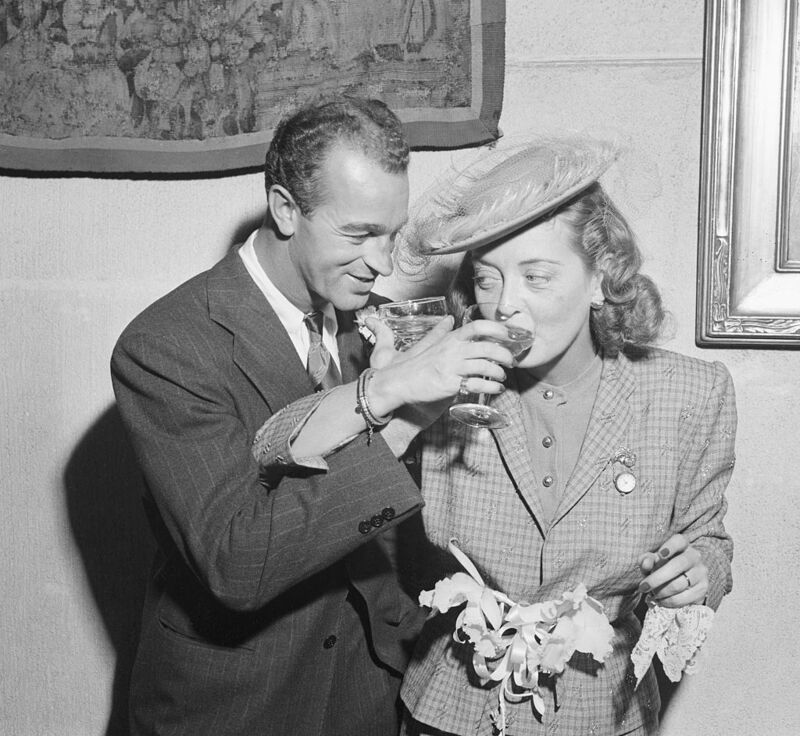 Legendary actress Bette Davis married four times in her life. Her first marriage was to a bandleader in 1932 and ended in divorce five years later. Davis’ second marriage to Arthur Farnsworth seemed promising, but he died in 1943, three years into their coupling. Her third marriage in 1945 to William Grant Sherry was the most interesting because he claimed to have never heard of her and as such, wasn’t “intimidated by her.” While Davis liked the idea of dating an unknown person, the marriage also ended in divorce 5 years later. 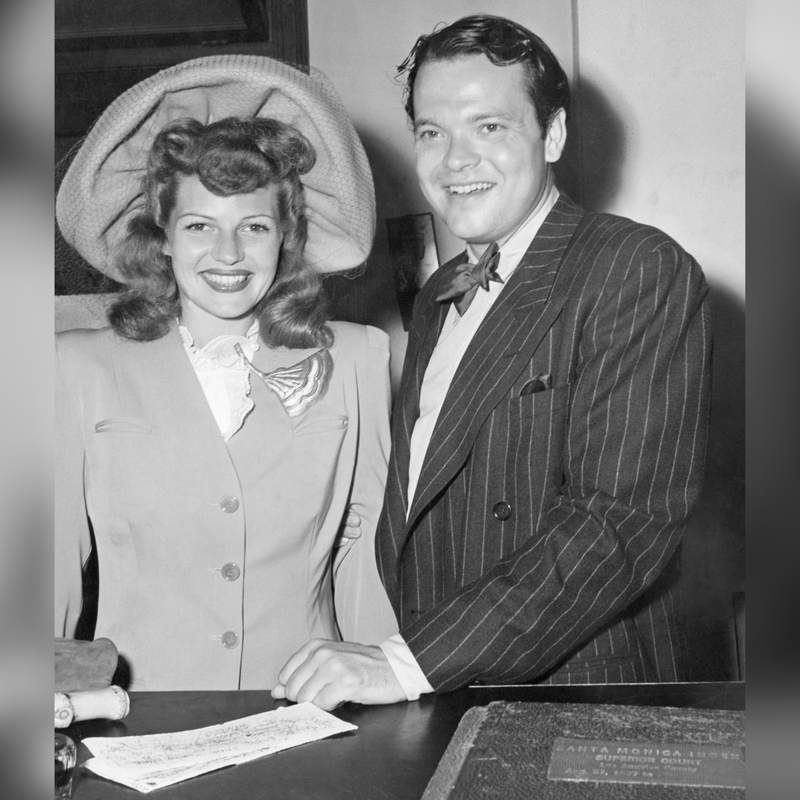 Over the course of her lifetime, Rita Hayworth was married a whopping five times. Her second marriage to producer and director Orson Welles only lasted from 1943-1948, but it seemed to be the one she wished was successful. When asked why the marriage failed, Hayworth said it was because he had no interest in settling down and establishing a home. Even later in life, Welles admitted that he was lucky to have been with her longer than any other man.